Needham’s Jake Shuman stares down his shot en route to winning his second straight Division 1 individual title, this time in a playoff. Earning his second straight player of the year award, thanks to another state individual title, Shuman led the rockets to three straight Bay State titles and a fifth-place finish at states. A year-round golfer on the amateur level, he will attend Duke. May captured the Division 2 state title, firing a 73 at Blackstone Country Club. He was a Cape Ann League All-Star for the second straight year and won the CAL Open. He is an honor roll student and hopes to play golf in college. Warner captured the Division 3 North Sectional title and followed that with a seventh-place finish at States. He also finished third in the DCL tournament, which earned him league All-Star honors for the second straight year. A senior captain for the Division 3 state champions, Benshoff led the way at the state tournament, firing a 76 at Blackstone that was good for fourth place individually. A three-time DCL all-star, he finished fourth at the league meet. Bertelson fired a 72 at the Division 2 state tournament but lost a sudden-death playoff and finished second after earning seventh place at the North sectionals. A DCL all-star, he is a high honors student and is also a member of the swim team. A two-time Tri-Valley League All-Star, Boldy finished second at the South Sectional tournament by turning in a 73 and followed that with a third-place 75 at the Division 2 state tournament. He is also a TVL all-star in hockey. DiLisio turned in the low round of the North Sectional tournament shooting a 69 to capture the title. He followed that with a second-place 72 at Black Swan in the state tournament. He is a two-time Catholic Conference tournament champion. Hutchins fired a 74 at the Division 1 state tournament at Black Swan good for third place after a sixth-place finish at North Sectionals. A junior captain and three-year starter at L-S, he was the team’s leading scorer and earned DCL All-Star honors. Linemayr had a 39 scoring average this season and shot 77, the lowest score at the EIL Tournament. He has eight NHGA and NEPGA wins, was a medalist at the Wentworth by the Sea Junior Classic by shooting 73, and is an honor roll student. 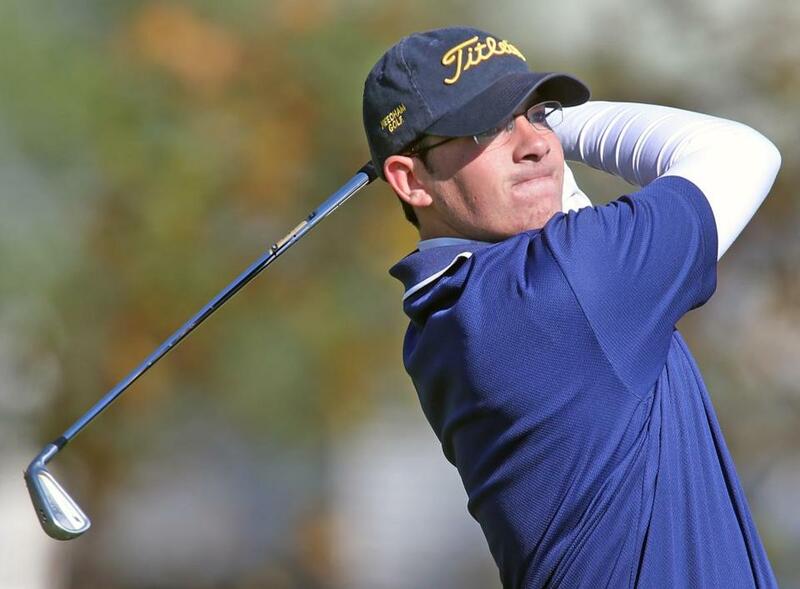 McInerney was the top player for the Hakws this season, tying for second at the South Sectional after firing a 74 to help Xaverian to the team title. At States he turned in a 77, which was good for seventh overall. Neidermire earned medalist honors at the Division 2 South Sectionals, turning in a 72 at Easton Country Club. At the state tournament he finished tied for third, shooting a 75 at Blackstone. A Tri-Valley All-Star, he also won the Norfolk County Junior Classic this year. The two-time MVC Player of the Year, Nelson turned in a second place 73 at the Division 1 states including a hole in one on 17. He also finished third at the North sectional tournament. A star basketball player at Central, he will play basketball at Fairfield. Organisak fired a 72 at Black Swan to tie for first at the Division 1 states before losing a sudden-death playoff. He also shot a second-place 72 at the North Sectionals. A year-round golfer in amateur events, he also plays tennis at L-S.
Parrish fired a 77 at the Division 3 South Sectionals to take home the top spot and followed that with a second-place 72 effort at the state tournament. He was a Tri-Valley All-Star, finishing second at the league tournament. He also skis and runs track at D-S.
Richard won the Catholic Central League individual title this fall and helped lead AC to the league title and a third-place finish at the Division 3 tournament thanks to his team-best 77 at Wyantenuck Country Club. An honor student, he also plays hockey at AC. Shelbourne was the EIL MVP after going 10-2 and shooting a 78 in the EIL Tournament to help Pingree to a second-place finish. He also plays baseball in the spring and wants to golf in college. The top golfer on the best squad in Division 3, Zhang fired a 74 at the state meet to capture second place individually. He also took home second in the sectionals with a 71. His efforts this year earned him DCL all-star honors for the second time. Pastore had a deep team this year that was good enough to win the Merrimack Valley Conference with a 13-3 dual-meet record. After finishing second at the North Sectionals the Raiders qualified for States as a team, where they finished fourth. Rose helped lead the Lakers to an 18-0 regular season and with it the school’s first South Coast title in 19 years. A 1970 graduate of Dighton-Rehoboth and owner of 332 career wins, he said this was the deepest team in his career. Sarmiento led AC to an undefeated 13-0 dual-meet season that earned the Cougars the Catholic Central League title. His squad followed that by winning the Division 3 North Sectional. He also coaches basketball at Wayland. Atlantic Coast — Dennis-Yarmouth: Jacob Eno, Neil Foley. Falmouth: Jake Beaton, Sam Newman. Marshfield: Joe Cincotta, Fergus Keane. Nauset: Dan Cambell, Andrew Flynn, Ben McCarthy. Plymouth North: Dan Cambell. Sandwich: Mithran Denbow, Steve Galanis, Connor Mangleson. Bay State — Dedham: Matt Maloney. Framingham: Max Ferrari. Milton: Colin McCabe. Needham: Taylor Kay-Green, Jake Shuman. Newton North: Charlie Goldberg. Walpole: Rob Boush, Jack Donnelly. Wellesley: Matt Finnerty. Weymouth: Chris Flipp. Big Three — Brockton: Justin Allen, Daron Merian, Korey Paull. Durfee: Brian McDonald. New Bedford: Justin Bennett, Justin Ferreira, Quinn Indio. Cape & Islands — Sturgis East: Emily Rodricks. Sturgis West: Samar Ghai. Cape Ann — Georgetown: Kyle Nelson. Ipswich: Austin Rubino. Manchester Essex: Ben Bichet, Michael Fuca. Masconomet: George May. Newburyport: Brendan Crowther, Travis Koocher. Pentucket: Krystal Knight. Rockport: Abby Hood. Triton: Jon Seward. Catholic Central — Archbishop Williams: Mike Davis, Cullen Lyne, Cam Mariani, Eddie Riley. Arlington Catholic: Gary Babigian, Sam Jennings, Jake Peer, Matt Peterson, John Richard, Nate Tikonoff. Austin Prep: Andrew Gerety, Nicholas Hampoian, Alexander Maffeo, Robert Pagano, Cameron Russo. Bishop Fenwick: Curtis Craffey, Matt Garofalo. Cardinal Spellman: Rob Conroy, Ryan Joyce. Lowell Catholic: Michael Guay, Nathaniel Kabogoh, Corey Vaillancourt. Marian: Zach Moore. Matignon: Chris Carrier, Ryan Mahan. St. Joseph’s Prep: Thomas Tran. St. Mary’s: Brad Dill, Shawn MacBurnie, Chris Price. Catholic Conference — BC High: Brendan Ridge, Matt Robinson. Catholic Memorial: Andrew Boyle, Andrew O’Leary. Malden Catholic: Mike Moschella. St. John’s Prep: Steven DiLisio, Chris Francoeur, Jeff O’Connor, James Turner, Mark Turner. Xaverian: Rob Fallon, Mitch Kubik, Mark Lallak, Andrew McInerney, Kevin McInerney. Dual County — Acton-Boxborough: Cameron Giles, Colin Grady. Bedford: John Dickinson Meltz, Ben Johnson. Boston Latin: Graham Gazogian, Jake Woods. Concord-Carlisle: Drew Benshoff, Sean Morahan, TianLin Zhang. Lincoln-Sudbury: Matt Hutchins, Ross McCann, Matt Organisak. Newton South: Jake Fink, Matt Marcus. Waltham: Charlie LeClair, Kevin Snow. Wayland: James Jurist, Nick Morgan. Westford: Jack Koravos, Zack Miller, Zach Reid. Weston: Will Bertelson, Jake Evans, Ben Warner. Eastern Athletic — Bishop Feehan: Davis Charfield, Patrick Chatfield, Dan Lynch. Bishop Stang: Zachery Reed, Evan Winterhalter. Coyle & Cassidy: Joseph Minicucci, Christopher Studley. Martha’s Vineyard: Kat Debettencourt, Matt Marchand, Ben Poole. Somerset Berkley: Jared Silva. EIL — Bancroft: Aditya Dharampuriya, Ace Ensign. Beaver Country Day: Arjun Bakshi. Berwick: Alex Hopkins, Luc Linemayr, Sam Zimmerman. Landmark: Matt Pramas. Lexington Christian: Peter Cusanello. Pingree: Brandon Franco, Alec Shelburne, Griffin Whitman. Greater Boston — Cambridge: Rafael Goldstein, Bill Preytis. Everett: Stephen Faia, Chris Roderick, Michael Scarpetti. Malden: Piero Pocobene, Tristar To, Nick Ward. Medford: Adam Gabaree, Connor Lonergan, Dominic Ramasci. Somerville: Justin Carrey, Cody Fitzgerald, Austin Silverti. Hockomock — Canton: Mike Breviglia, Sam Riemer. Foxborough: Kyle Newcomb. Franklin: Ben Bedarian, Stephen Wyman. King Philip: James Baxter, Michael Pergola. Mansfield: Tom Eames. North Attleborough: Adam Lareau. Oliver Ames: J.P. Abela, Nick Carter. Sharon: Max Crooks, Angela Zhang. Stoughton: Michael Milavec. Taunton: Jarett Leonard, Ryan Oberg. Lighthouse — Cape Cod Academy: Caleb Dalterio, Tanner Malkasian. Nantucket: Emmet Daly, Ronan Daly. Mayflower — Bishop Connolly: Nick Avilla. Blue Hills: Nick Doyle. Bristol-Plymouth: Brian Cain, Brandon Greene. Diman: Zach Astle, Alex Began, Tanner Begin, Nick Phillips. Norfolk Aggie: Mitch McGowan. Old Colony: Jordan Fernandes, Adam Ferreira, Ted Romanelli, Evan Sylvia. Sacred Heart: Collin Gillis, Luke Meyers, Anthony Norris. South Shore Voc-Tech: Pat Daily. Southeastern: Matt Nirlason. Tri-County: Chris Boyd, Jake Ducharme, Kyle Hobbs, Drew Zaiter. Upper Cape: Devyn Buckley. West Bridgewater: Dillon Anderson, Brandon Bercovitz. Westport: Matt Murphy. Merrimack Valley — Andover: Ryan Burke. Billerica: Joe Brunelle, Nick Fantasia. Central Catholic: Kyle Dunn, Mark Mancini, Tyler Nelson, Patrick Silk. Chelmsford: Tommy Connolloy, Eddie Luo. Dracut: Dan Zabbo. Haverhill: Sean Bellemore. North Andover: Justin Myerson. Tewksbury: Jeff Giasullo. Middlesex (Freedom) — Burlington: Jake Goldstein, Max Paraskevas, Joe Scali. Melrose: Joe Botelho. Wakefield: Kevin Lamatting. Watertown: Joe Bannon, Anthony Busconi. Wilmington: Ryan McEvoy. Middlesex (Liberty) — Arlington: Mike Schiller. Belmont: Kole Kelly, Andrew Lilley, Michael Pergamo. Lexington: Jack Lang, Ben Scott, Tom Wood. Reading: Chris Ehl, Alec Tzianabos. Winchester: Stephen Michienzi. Woburn: Mike Foley, Joe Santullo. Northeastern — Beverly: John Cairns, Shamus Desmond. Danvers: Wes Milbury, Mike Plansky. Gloucester: Curtis Quinn. Lynn English: Matt Sensabaugh. Marblehead: Owen Picariello, Pitch Riley. Peabody: Nolan Franey. South Shore — Abington: Etienne Bourgoin, Joe Marella. Carver: Brandon Walsh. Cohasset: Bryce Avila, Derek Benson, Jack Stanganelli. East Bridgewater: Greg Carroll. Mashpee: Adam Bryant, Mike Griffin. Monomoy: Evan Forgeron, Ryan Kiem. Norwell: Jack Christian, William Christian. Rockland: Trevor Trudeau. Tri-Valley — Dover-Sherborn: Paul Parrish, Sam Schroeder. Holliston: Cody Pennypacker. Hopkinton: Jimmy Hervol, Geoff Holler. Medfield: Dan Neidermire, Brett Thomas. Medway: Mike Boldy. Westwood: Dan Howard, Ned Kelly.